Not only clean, excellent power of i. More energy-saving by inverter controlled fan motor. Motor efficiency has been 5% advanced by permanent-magnetic motor. It became an age when the corporate profit is given by the environmental investment. Higher cleaning leveled compressed air is requested from all industries. And, making the mechanism, not to put industrial waste out by the approach of 3R becomes important, because of the infrastructure equipment. It is exactly a big turning point from oil type to oil free type. 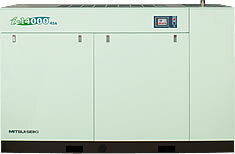 i-14000 series is the ideal form of inverter-oil-free-compressor, innovated by Mitsui-Seiki to respond to the needs in this century. High-efficiency increasing control compliant at optimum pressure. Mechanism of water lubrication which is simple and environment-friendly. A smooth operation management is possible by the IT touch panel adoption. *The figure in ( ) is the discharge air volume 0.39MPa specification model. The 0.39MPa specification dryer is installed separately. Ask us if you want to know the dryer's dimensions and weight.